I'm always the worst person in an emergency - I panic at the sight of blood and want to turn inside out at the thought of broken bones and misshapen limbs. My lack of first aid knowledge is partly to blame, I'm sure - you want to act quickly and do something useful but have no idea how to help so instead run around like a headless chicken, the intensity of flapping arms equalling the level of concern. Great visual display but not particularly useful to a victim. Time for some first aid training :) The school booked me on a comprehensive First Aid course - an intensive 12 hours spread across a day and a half. It was awesome!! I totally loved it and came away with a good knowledge of first steps to take. 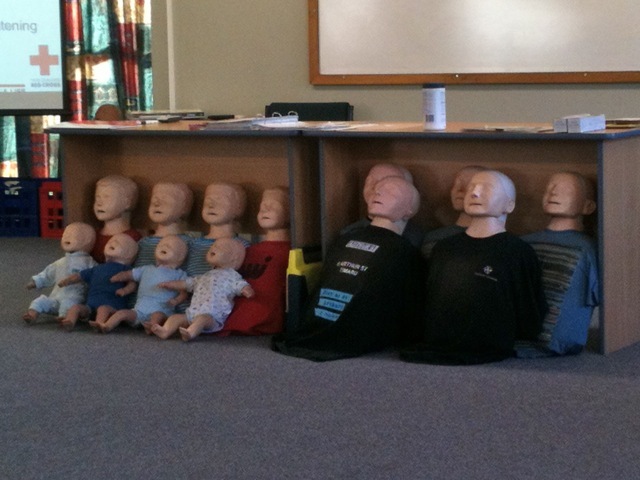 The CPR practice was exhausting - I had sore stomach muscles after just four sets of compressions and breathing!